Let’s talk for a minute about one of my favorite breweries that most people outside the city of Winston-Salem don’t know about. I’m talking about Hoots Roller Bar & Beer Co., located just outside of downtown Winston-Salem.While a few short years ago, the only brewery people knew about being in Winston was Foothills Brewing. While Foothills creates some great and well known brews, the city was calling for another great brewery. Two friends, Eric Weyer and Eric Swaim, felt that need and want for a brewery. One that focuses on high quality beer, with a passion for producing a core lineup of brews that don’t just have funky names and taste “okay,” but, rather just dang good beer’s that keep people coming back for more. Hoot’s was opened by the dynamic duo and they have been killing it. Hoots is located in the Old Roller Mill, just across from RJ Reynolds High School and next to one of our great distilleries: Sutler’s Spirit Co. 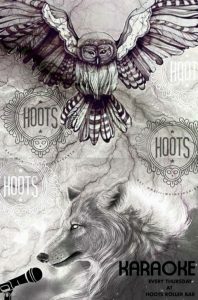 If you haven’t had a chance to try one of Hoots Brew’s, make sure you check them out and have a pint at their in house bar or look for them at any fine establishment in Winston-Salem. As always, friends, #DrinkLocalNC and make sure you listen to Sipping NC.